The problem with freedom of speech is that it is often regulated and monitored. Especially with the booming of the internet, sources are easily obtained, sometimes altered and news go viral quickly. Stepping up and regulating the social media game is a huge task and because of the fluidity of internet content, it is often hard to pinpoint a legal validity to articles. 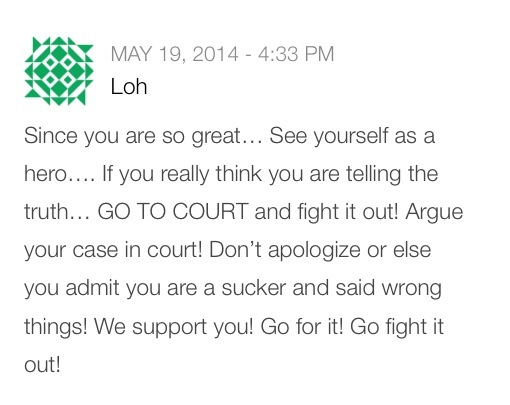 The recent case of a young Singaporean proved the point that the publishing of half truths can be disastrous. Roy, who runs a political blog based in Singapore was threatened with a letter of demand following his entry on an alleged claim of PM Lee’s misappropriation of the CPF funds, amidst the law that is set to be of effect in July 2014 that the CPF minimum sum to be raised to S$155,000. Roy, among other like-minded Singaporeans, suggests to have a more transparent system concerning the citizens’ CPF funds and how it is being managed. 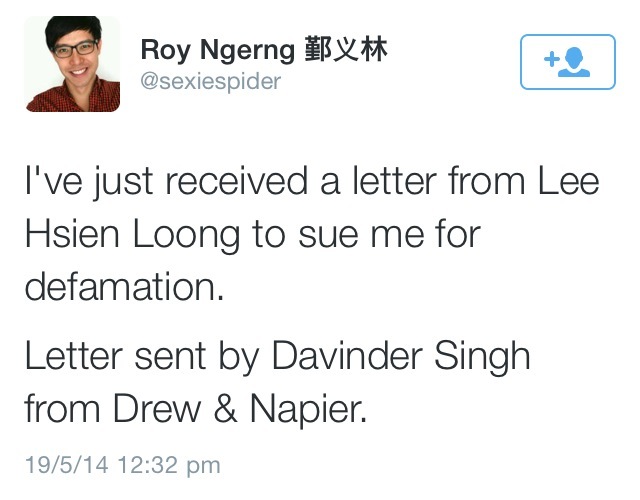 Roy has also drawn up a petition to demand an explanation from the Singapore government. The petition has since reached 1,000 signatures on 20 May 2014. An event will be held on 7 June 2014 at Hong Lim Park in support of this concern. 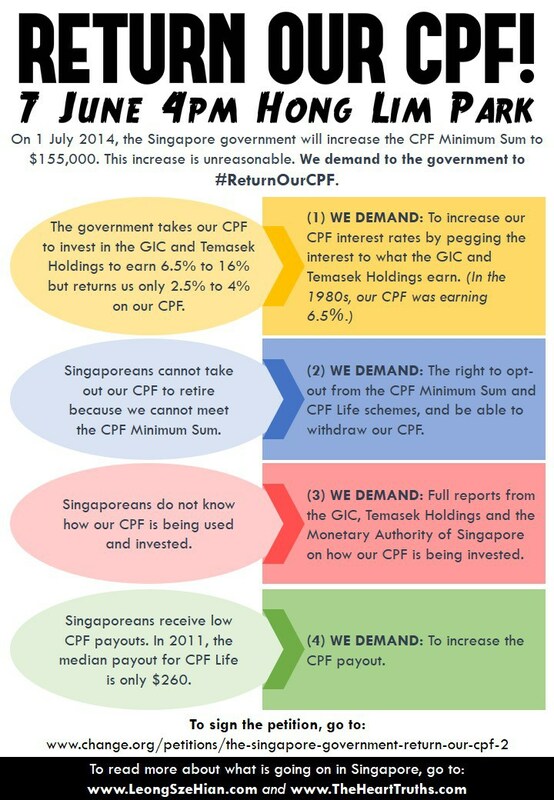 Roy says: Singaporeans cannot take out CPF if minimum sum is not met. Government says: CPF takes into account the amount used to buy houses and converts it as part of the retirement assets. Roy says: Harder for Singaporeans to withdraw and meet the minimum sum. Government says: Increment of minimum sum is essential to combat inflation and protect real value of currency ahead of retirement. Roy says: PAP started a massive import of cheaper labour since 2004, depressing the wages of Singaporeans further. Government says: Fertility rate is too low; menial jobs are less popular amongst Singaporeans, hence a need to get cheaper foreign labour. It would be a futile effort for Roy to put himself against the PM of Singapore because he will lose in terms of the legality based on his social status and credibility. It is great to have an alternative voice as it gives a different vantage point and that is essential for a forward-moving nation. While freedom of speech should never go to such an extent to clear, in-your-face defamation, we need to exercise caution when mentioning highly prominent political figure and to validate the degree of self-censorship in an age where anonymous eyes are watching. You may read up Roy’s views on The Real Singapore and the government’s for a better understanding on this issue.